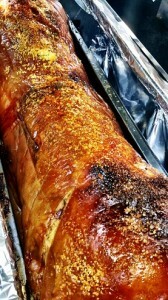 Being a hog roast Barnet caterer by trade and with the high demand for hog roasts in Barnet I work throughout year, busier in summer but there is always a party going on somewhere. The most important aspect of my work is the enjoyment that I bring to others. It is after all about the people. Whether attending relaxing outdoor public events or even indoor private ones, they are — warm, open-hearted and welcoming. Any event that I cater, any hog that I roast, is sure to be a success as long as the people are having a good time. 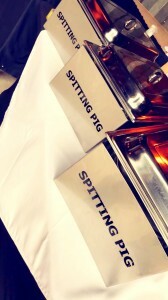 Spit-roasting has become an extremely popular choice for hog roast Barnet catering events over the last few years. It’s affordable, fresh, and can be a very healthy way of eating, too! I have been a caterer for many years but it was only about two years ago that I realized this growing popularity and decided to specialise in my work and took to the idea of purchasing a hog roasting machine. 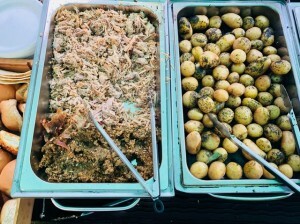 It was an easy decision to make, once I looked at what was on offer in the world of hog roast hire Barnet. I went straight to the nation’s number one manufacturer of hog roast machines, The Spitting Pig Company, and I purchased a Titan Roaster. And thus began my career as a hog roaster. The sheer versatility of these machines, being able to roast whatever meats you wish to serve, and the machine’s easy manoeuvrability, means I am able to take these machines wherever I need to go to cater for public or private events. One of my first events in Barnet was quite a big one, with a very precise menu (although they did opt against a starter) that needed to be tailor made for the 200 guests attending the function. I was held at a nearby hotel in the grand hall. Many different companies attended the banquet which was the reason for such a diverse menu. 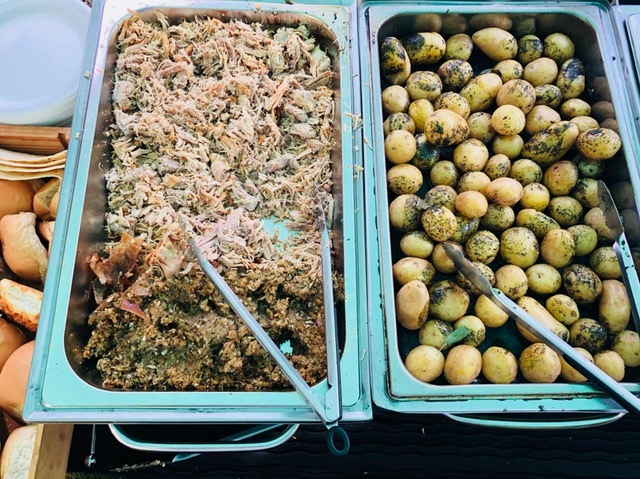 On the day we roasted pig, chicken and turkey for the various requested menus and added seasonal vegetables and roasted new potatoes in herb butter. There were 12 vegetarian meals we needed to prepare as well so with began with them as the meets were roasting. The vegetarians were served Spanish quiche. We served the meals at 7:30pm and sent our staff out to make sure everybody had enough to drink. We prepared chocolate torte and sticky toffee pudding for the desserts whilst the mains were being enjoyed. Eyes lit up when they saw the fabulous desserts we had prepared for them! The DJ played music throughout the meal and once stomachs had settled on came the dancing shoes as we left the guests to party into the night. I find myself being asked to cater plenty of events throughout the year; and most recently, I was asked to deliver what I have come to call Hog Roast Barnet for their local football club, at their very own Underhill Stadium. Located in a Borough, Barnet began life as a small hamelt in Saxon times as little homes within a densely packed forested area. It now has a lovely market, nice homes for commuters who work in any number of nearby larger towns and cities; and let’s not forget, its own Barnet FC. I always use meat that is as locally-sourced as possible. For this occasion, knowing I would be catering to whole families who enjoy supporting their team, I chose to serve pork, which I of course, set up on the spit-roasting mechanism, chicken, and sausages. The meat was all of exceptional quality which was enhanced perfectly by my working with the best hog roasting machines available. I was told to expect about 800 people. Because it was set to be a large gathering, I contacted the Spitting Pig Company and asked if they would be able to help me arrange for a hog roast hire Barnet package. I wanted to be able to use a smaller machine as well as my Titan Hog Roaster, which they were able to provide with no problem; and also, a few of their catering staff in order to maximise the efficiency of my serving time, since I normally work alone or with only just one assistant in tow. The Spitting Pig Company offer exceptional hog roast hire packages in terms of flexibility, affordability, and efficiency. They were very accommodating, sending the staff and equipment to the exact area needed and in plenty of time so that we were easily able to have everything pretty much ready before the party began at noon. Tables were set up with a good variety of sauces and condiments, homemade applesauce, as well as homemade sliced stuffing. We also had several different types of rolls that we were able to offer for sandwich-making. Hog Roast Barnet has turned out to be very popular with everyone; and, the actual cooking process is so easy on Spitting Pig-manufactured roasting machines that the meats practically cook themselves. The chickens and the pork were both being spit-roasted; the sausages cooked on the grill and with a little bit of turning, were soon finished to perfection. It went as smooth as clockwork with the Spitting Pig staff. It was almost as though they’d done it all before! (That’s a joke, because they have!) The staff of the Spitting Pig Company are quick, efficient and friendly to everyone. I was able to make a profit even with the cost of the machine and staff hire. Both were very competitive and affordable. My Titan Roasting Machine paid for itself after only one or two events. They are reliable, worthy assistants and an integral part of my very successful catering business.